Publics around the world believe the global balance of power is shifting. China's economic power is on the rise, and many think it will eventually supplant the United States as the world's dominant superpower. However, China's increasing power has not led to more positive ratings for the People's Republic. Overall, the U.S. enjoys a stronger global image than China. 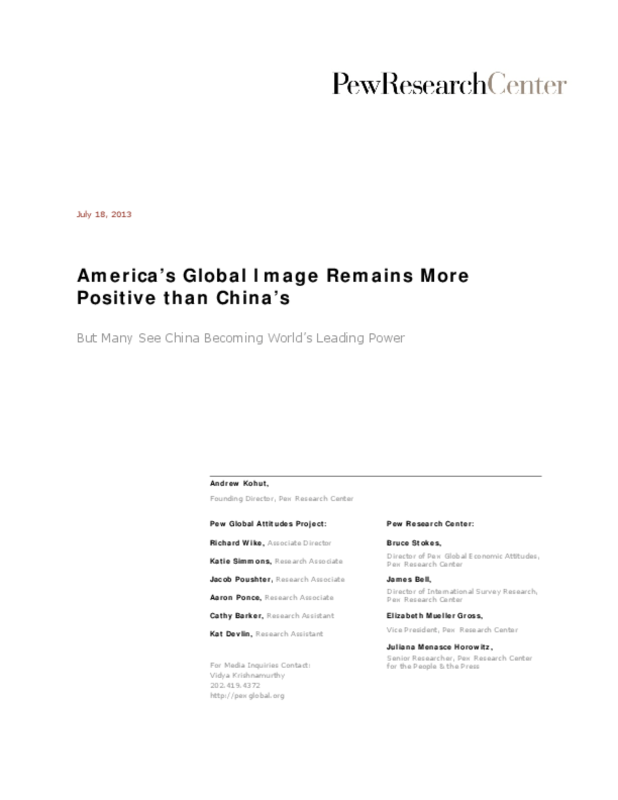 Across the nations surveyed, a median of 63% express a favorable opinion of the U.S., compared with 50% for China. Globally, people are more likely to consider the U.S. a partner to their country than to see China in this way, although relatively few think of either nation as an enemy. America is also seen as somewhat more willing than China to consider other countries' interests. Still, both of these world powers are widely viewed as acting unilaterally in international affairs. And the military power of both nations worries many. China's growing military strength is viewed with trepidation in neighboring Japan, South Korea, Australia and the Philippines. Meanwhile, the Obama administration's use of drone strikes faces broad opposition -- half or more in 31 of 39 countries disapprove of U.S. drone attacks against extremist groups. Respecting individual liberty remains the strong suit of America's image. Even in many nations where opposition to American foreign policy is widespread and overall ratings for the U.S. are low, majorities or pluralities believe individual rights are respected in the U.S. Across the nations surveyed, a median of 70% say the American government respects the personal freedoms of its people. In contrast, a median of only 36% say this about China. Copyright 2013 Pew Research Center.